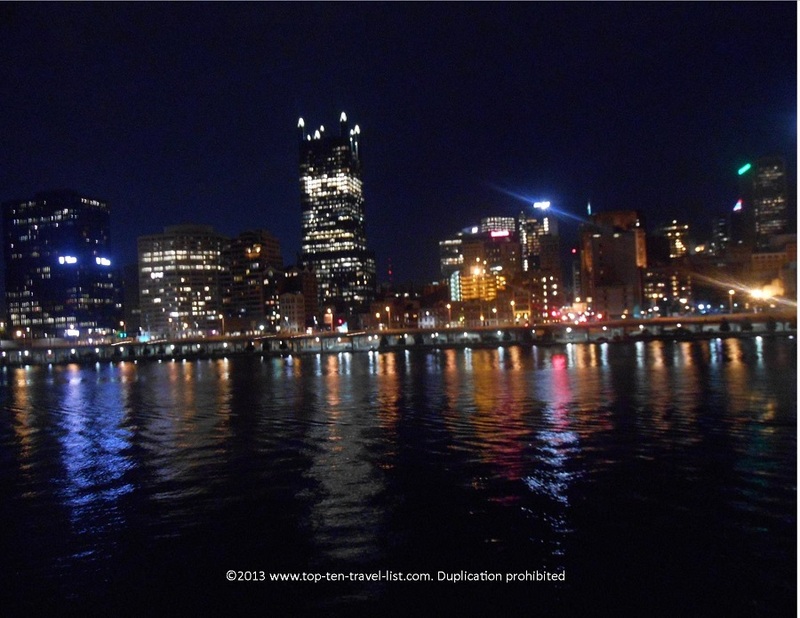 Fantastic Pittsburgh Skyline Views: Duquesne Incline & Station Square - Top Ten Travel Blog | Our experiences traveling throughout the US. On our road trip home from Chicago, Mike and I wanted to check out a new city. We had heard a lot of good feedback about Pittsburgh. Since it was near the halfway point of our route, we decided to give it a try. Pittsburgh was a lot nicer than I expected with a beautiful skyline, an easy to navigate downtown area, and 3 professional sport team venues all located downtown (Steelers, Pirates, and Penguins). 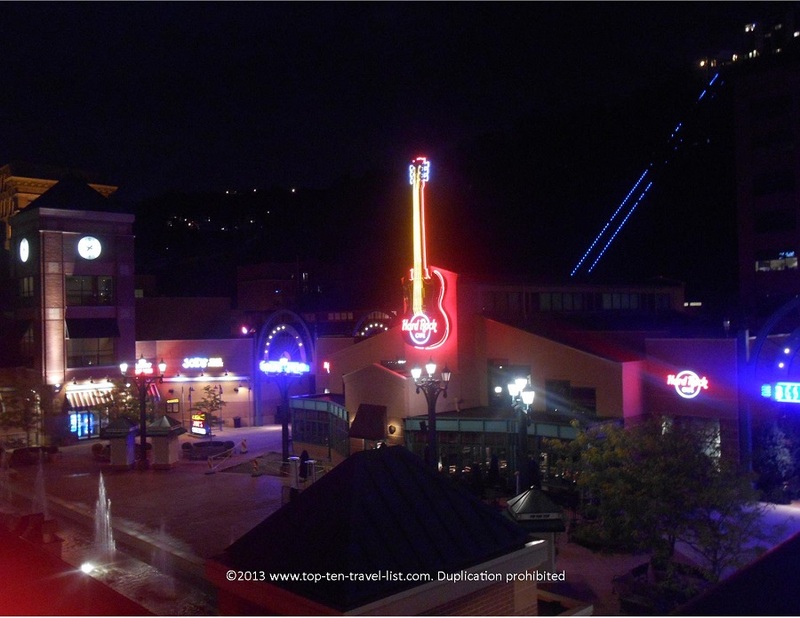 There is an entertainment complex downtown called Station Square, which offers themed restaurants, shopping, tourist attractions, and awesome skyline views. 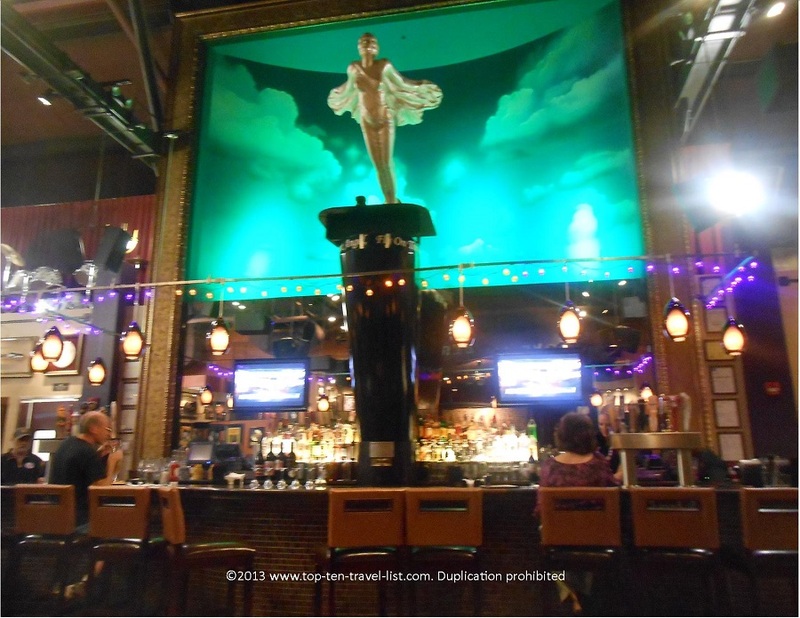 We headed over here mainly to dine at the Hard Rock Cafe (we collect the glasses from each new location we visit). We ordered our usual favorites: spring rolls as an appetizer, twisted macaroni and cheese, and a turkey burger). 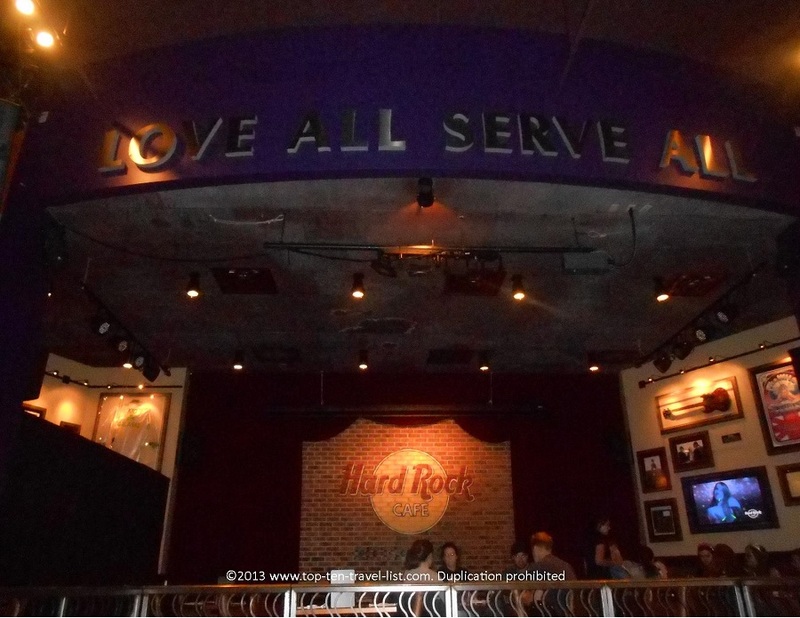 Hard Rock offers a diverse menu, affordable prices, unique souvenirs, fun music, and interesting memorabilia. 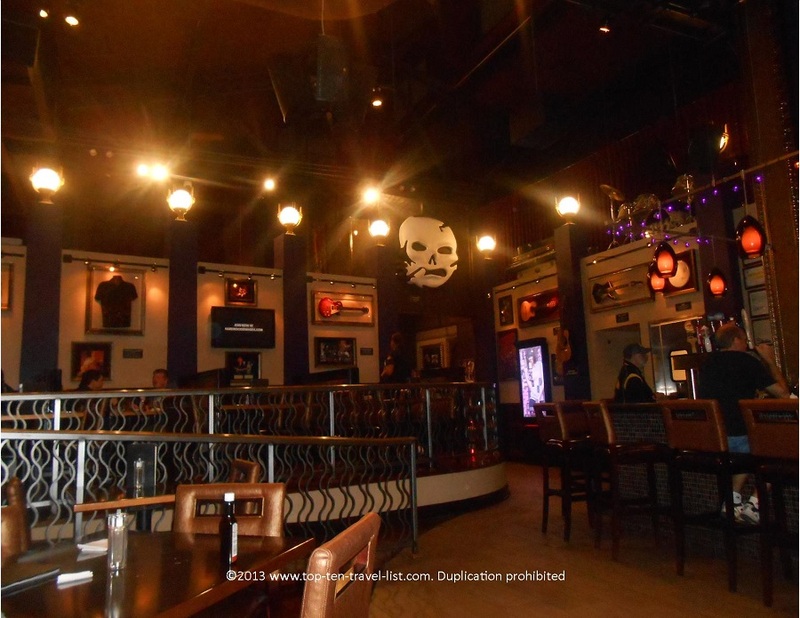 This Hard Rock location is small, but features a lot of cool interior decor. There is a nice outdoor patio with great views of the river and skyline (great for summer night dining). Other restaurants include: Buca di Beppo, Houlihans, Bar Louie, Joe’s Crab Shack, The Melting Pot, and a handful of other favorites. 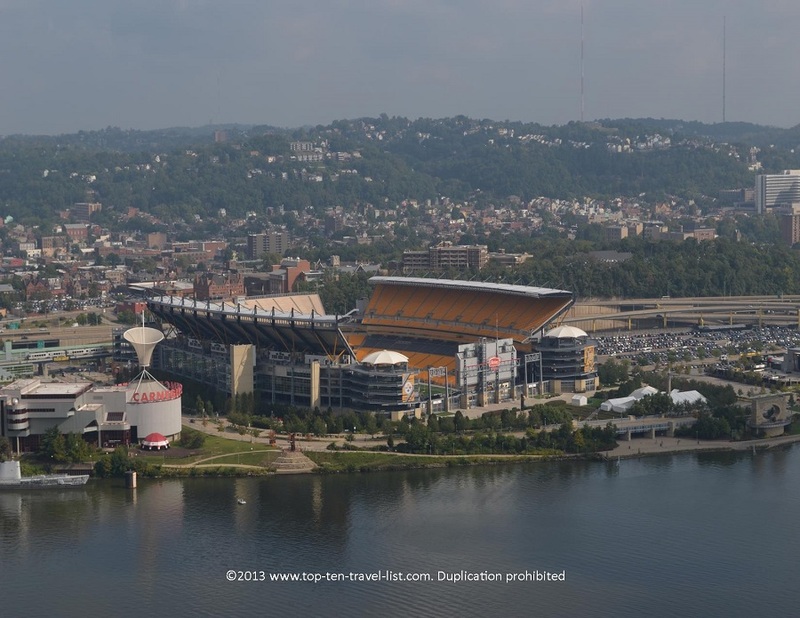 Shopping options include: bookstores, jewelry shops, sports apparel, craft stores, and Pittsburgh souvenir shops. Parking will be validated if you spend $50, which is a pretty nice deal if you plan on shopping anyways. There is a pretty choreographed fountain show which runs every 20 minutes from 9am – Midnight (April-November). Tourist attractions include: boat rides, horse and carriage rides, trolley rides, duck tours, and more. If you feel like exercising while taking in the beautiful views, you can take a 1.5 mile along the Pittsburgh Riverwalk. 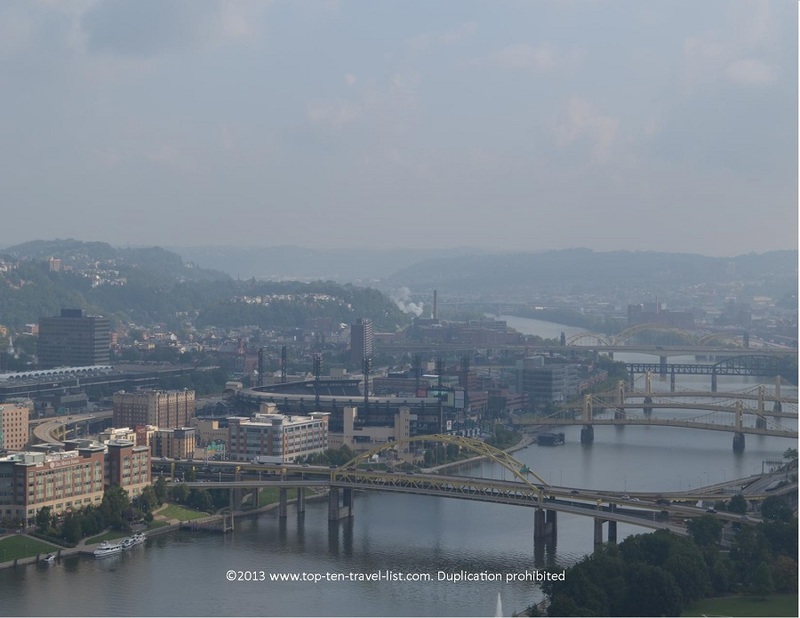 Station Square is home to a beautiful view of the Pittsburgh skyline. After dinner, we took the elevator up to the observation deck. We took some beautiful night views of the skyline. 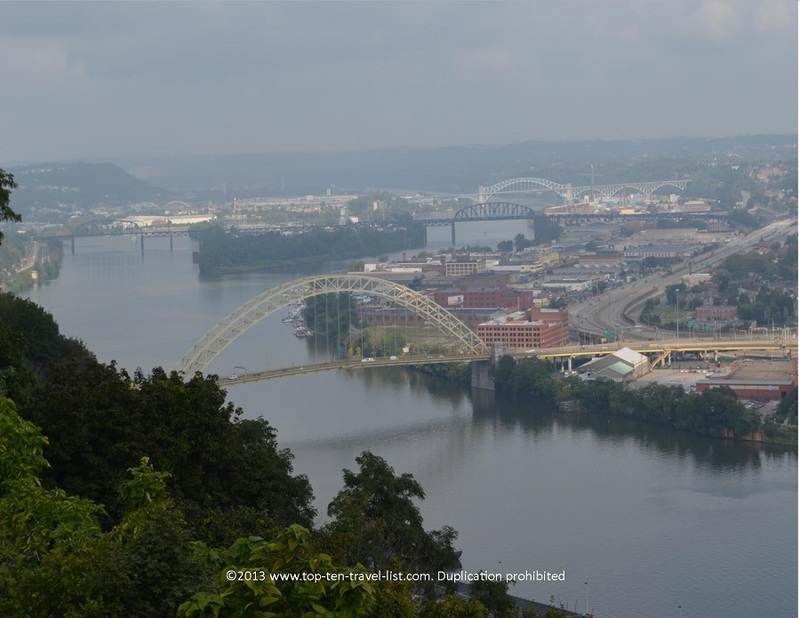 The 2 most popular tourist attractions in the area are the inclines (Monogahela and Duquesne). Both of these offer spectacular views of the city. These cable car rides take you up to Mt. Washington where you will be treated to panoramic views of the city. The observation deck is a fantastic place, not only for city photography, but also for stadium, river, and bridge photography. 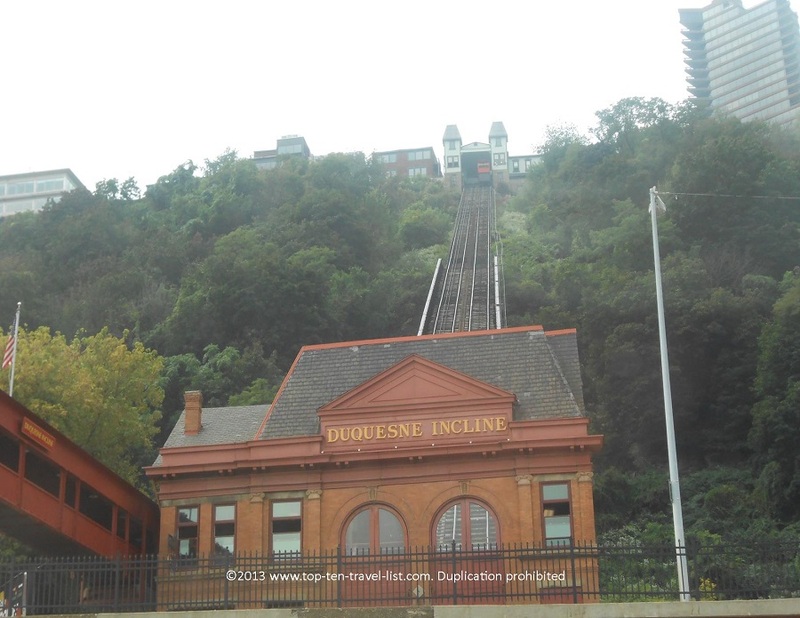 The Duquesne Incline was voted by USA Today as one of the Top 10 Places in the World for Viewing a Cityscape (the photo at the top of the page was taken at the top of the incline). The incline operates 365 days a year at the rate of only $5 per adult roundtrip and $2.50 per child. 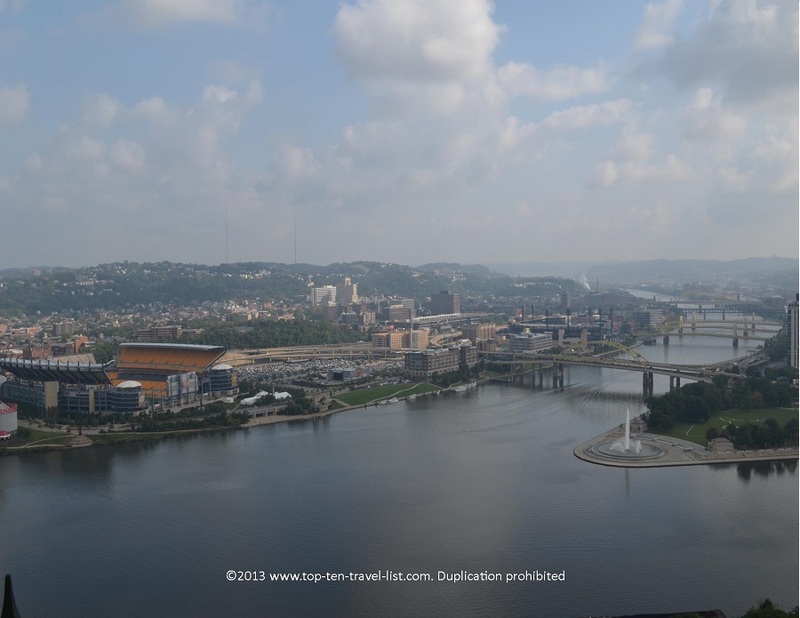 At the top, you will also find a museum and gift shop featuring Pittsburgh souvenirs. I really enjoyed the ride up as well as the spectacular views at the top. This is one of the best views of a city have ever experienced. Normally, you would have to take a pricey helicopter ride to experience such amazing views. 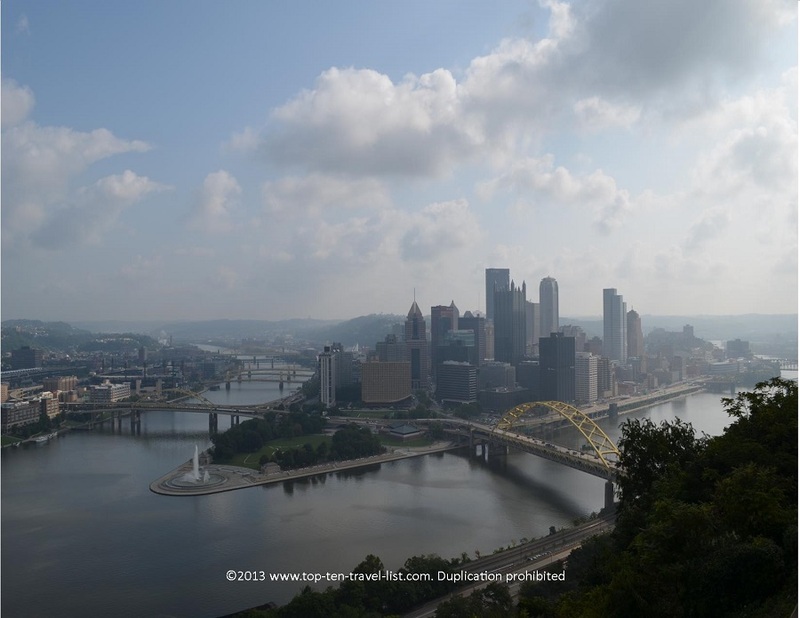 This incline trip only costs a few dollars, which makes it an absolute must on any trip to Pittsburgh. You have the option of taking the ride any time of the day. I wish we would have known about the night hours; I am sure you can get some amazing night photographs. The incline runs Monday-Saturday: 5:30am-12:45am. On Sundays, the incline runs from 7:00am-12:45am. The ride takes about 5 minutes each way, making it easy to incorporate into your vacation. Because it is open all day, you do not have to worry about trying to fit it in as is the case with many other tourist attractions. This is one attraction you cannot afford to miss. 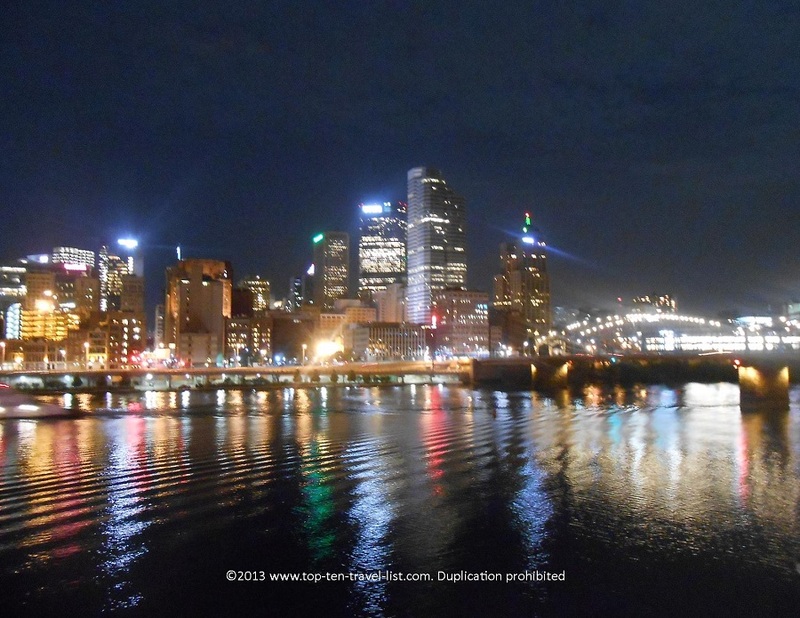 If you only have time for one attraction in Pittsburgh, place the Duquesne Incline at the top of your itinerary. A free parking lot is located at 1197 W. Carson St. Pittsburgh, PA 15219. For more information, visit the Duquesne Incline website.